Who are your kaitiaki? Early in April the senior students of Ngāti Toa School in Porirua had the opportunity to create colourful art to adorn the walls of our Māori Discovery Centre, Te Huka ā Tai. Their theme was Kaitiakitanga (Guardianship), looking at both who their own guardians are and what are the taonga that we all need to look after. And what a great job they did! After discussing and sketching their initial ideas in class, the students transferred their designs onto lino boards ready for cutting. This was the challenging part! The trick with lino cutting is to keep your supporting hand behind the one that does the carving, so you don’t cut it. Thankfully Miss Smith was at hand with sticking plasters ready for the few children who forgot this rule from the safety briefing and nicked themselves. Bravely the students soldiered on to complete their work. With linocuts the proof is in the print and on day 3 we brought a hired press to the school and began the process that would produce the final artworks. With Te Papa Educator Khali’s help the students inked up their boards, and put them through the press. Success! It was great to watch as linocuts turned into beautiful works of art expressing the children’s ideas. Now we have some great artworks to hang in Te Huka! 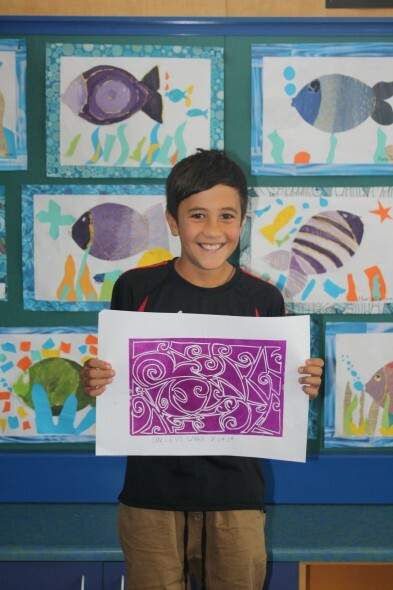 The Ngāti Toa School art project is linked with the Ngāti Toa Rangatira Iwi exhibition and will open on Saturday 14th of June along with the main exhibition. Come along and see not only the glorious art display, but the cool ideas and thoughts the children put into their artworks, displayed in the profile book. We’d love to see you there!